This is part of our new "Pretend to be a San Francisco Tourist" initiative - wherein we pretend to be tourists to see all the great sites in The City that we have somehow managed to miss in the 26 years we have lived here. 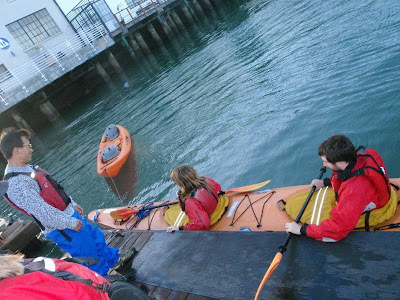 We signed up for a "Moonlight Kayak" under a full moon with City Kayak on Friday last. I don't know what we really expected. Maybe something like the picture from their website above. Nice flat water. Clear night. Paddle around for a while right off the piers and take a few pictures. Never actually read it of course. 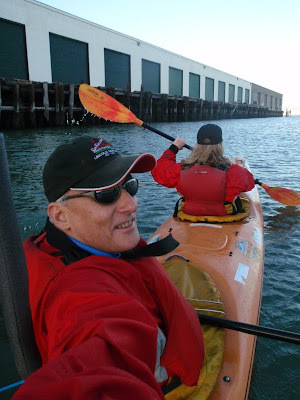 We started at Pier 40 right before sunset riding two-man sit-inside kayaks. 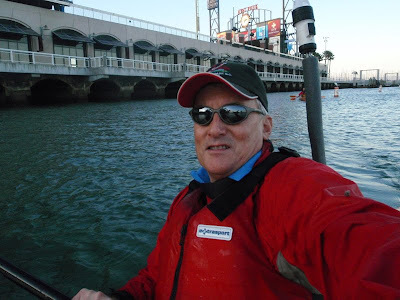 First over to McCovey Cove by the ballpark, under the drawbridge and back out. Nice and easy. Still daylight. Then to the base of the Bay Bridge, then the full length of the west span out to Yerba Buena Island. Then back. In the dark. In the wind. In the current. In the swells. In the shipping lanes under the bridge dodging ferries and tugs dragging giant barges and fighting their wakes. All in all - two and a half hours of a blister inducing pull. 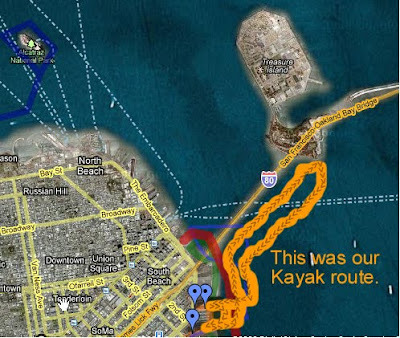 In retrospect - it was a great adventure for a couple of beginner kayakers. But we did not know what we were getting into. Our guide gets our new kayak buddies situated. Heading out from the pier. Little did we know. In McCovey Cove outside the ball park. I've seen this spot from a different vantage point. 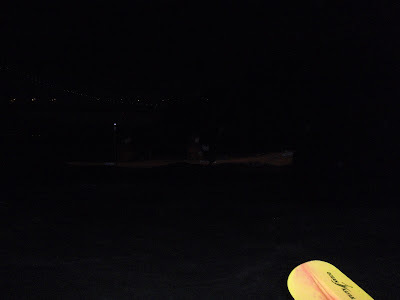 Somewhere in the middle of the Bay in the moonlight. Around here I stopped taking pictures and just concentrated on getting back. It was still great fun.